They may all be Tier 4 GEVOs, but each possesses unique detail characteristics. These road names represent four of the seven produced by ScaleTrains.com for its first N-scale Tier 4 GEVO production. The other road names include Canadian National, CSX, and special red ScaleTrains decorated releases. ScaleTrains.com recently delivered its first N-scale diesel locomotive model. The all-new General Electric (GE) Tier 4 GEVO offerings follow the hobby manufacturer’s Union Pacific (UP) “Big Blow” gas turbine locomotive. 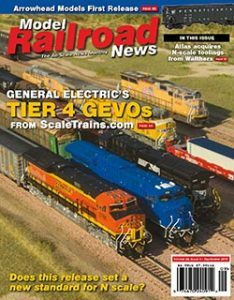 Next, ScaleTrains.com will bring GE’s C39-8 to N scale. This first production of Tier 4 GEVO diesel locomotive models provides a wide range of detail and feature variations. The models come powered with factory-installed Digital Command Control (DCC) and ESU LokSound audio or silent with standard DC set up. The model is fully assembled and multiple road numbers were produced for each road name. Since the early 2000s, the U.S. Federal Government’s Environmental Protection Agency (EPA) has worked toward reducing locomotive emissions by setting reduced emission standards for new locomotives to meet or exceed. January 1, 2015 marked the start of the most demanding “Tier 4” standards. GE was able to build off the base unit developed during the Evolution Series (ES44) to achieve Tier 4 compliant locomotives. Now with more than $600 million invested in the Evolution Series since 2005, GE has become the first manufacturer to provide Tier 4 units to Class 1 railroads. Most customers were concerned with the looming idea of employing the use of urea chemicals, such as the ones found in diesel exhaust fluid (DEF). DEF is a fluid used by most trucks after 2010 that relies on the chemicals to break down NOx into harmless nitrogen gas, a small bit of carbon, and a little water. In August 2012, GE rolled out the first ES44AC GECX 2015 build to meet the EPA’s Tier 4 mandate. Largely considered an engineering prototype, GECX 2015 was the first model to show the major body changes such as the maximum height prime mover hood and larger radiator section creating a V-shape in the rear. Customers were extremely happy to hear GE was able to achieve Tier 4 compliance without the use of DEF. The rest of the body closely resembled the ES44 design. One issue GE ran into with height was the placement of the air horn, due to the engine hood already being at its maximum allowed height. The demonstrator units all sported a forward-facing three-chime horn cluster near the front of the raised engine section or on top of the cab. Two rear-facing horns were installed in the rear panel of the radiator section. GE also finished a second Tier 4 ES44AC test-bed unit in August 2012 (GECX 21014); 2013 saw five similar over-the-road test units rolled out for mainline evaluation with BNSF and UP. GECX 2020–2024 saw active service, as well as time in the Transportation Technologies facility at Pueblo, Colorado. GE brought an additional 20 demonstration units out in 2015 to work with BNSF, UP, and Canadian National. These demonstrator units served as the base units to determine the configuration of future production models. I wanted to quickly touch on the GE model designations just in case some don’t know the difference between them. The ET44 comes in two available truck/operating configurations, the ET44AC and the ET44C4. The ET44AC is a standard ET44 wired with AC traction motors much like the ES44ACs were. These units sport traction motors on all six axles. The ET44C4 is an AC wired unit, but only has four traction motors on the outside of each truck. This is due to its ability to lift the center axle forcing more weight to the outside axles resulting in increased tractive effort. A big spotting difference is the presence of more piping in the truck frames of the C4s. ACs have the typical brake cylinders and pipe just above the truck, where the C4s have four cylinders for brakes and to raise the center axle. ScaleTrains.com produced a number of body variations to allow for accurate reproductions of this popular contemporary GE Tier 4 diesel. General Electric began testing and evaluating its Tier 4-compliant design with a series of blue demonstrators. ScaleTrains.com produced this early and unique body style shown decorated for GECX 2029 as one of the many versions offered for its N-scale Tier 4 GEVO release. Blue Demonstrator: The blue GECX 2029 is one of the 20 additional demonstrator units produced in 2014 for over-the-road testing among multiple roads. The paint appears expertly applied to the entire N-scale model with no spots, bleeding, or lighter/darker areas. The model is covered in small decals, which really make this solid blue locomotive stand out. After looking over the whole model, I was only able to find one missing label just to the left of the water sight glass on the fireman side, in comparison to the prototype. Another point on the water sight glass seems a bit exaggerated. The location is marked by a large white rectangle that stands out quite a bit, where on the prototype this feature is less noticeable. GECX 2029 has the correct three-chime/two-chime split air horn and antennas set up per the real unit. ScaleTrains.com has done a fantastic job with the separately applied details on these locomotive models. The grab irons look scale-sized instead of the thicker grabs on many other releases. The sun shades and mirrors on the cab are present and look great as well. The cab door is a really neat point on these locomotives, because ScaleTrains.com took the time to make it raised off the body. Most manufacturers would mold the door into the body shell. ScaleTrains.com has shown the door off the nose which adds to the visual depth of the front end of each unit. The trucks and fuel tank are very detailed with a lot of small piping detail.Dimensional molds help give a 3D look instead of just the front half of the details molded on. The underbody shows more of the attention paid with the many parts painted silver, red, or decaled just like the prototype. One example I always use is the bell on the fuel tank. Most manufacturers would just leave it colored whatever plastic they used for the tank. Very few go back and paint the bell the color it is on the prototype. This is one small detail many may overlook that stands out when shooting photos of these models. The engine hood has the correct raised middle with the non-tapered body around the exhaust. The rear of the unit has really good etched-metal grilles across the radiator section that add depth versus the regular molded grills. Both ends of these models have extensive air hose, MU cable, and other little details on the pilot faces which look absolutely stunning. You won’t stand trackside for long nearly anywhere in the U.S. today and not see a GEVO diesel. 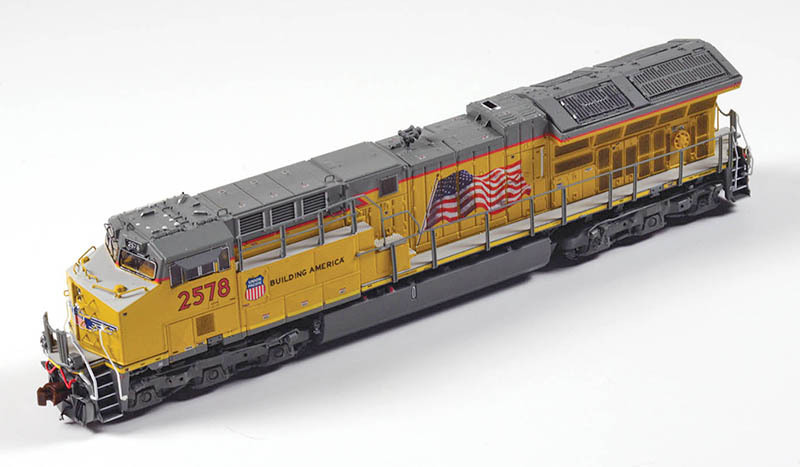 Union Pacific 2578 is an N-scale ScaleTrains.com Tier 4 GEVO model with accurate PTC antenna array on its cab roof and additional road-specific attributes. Armour Yellow: Union Pacific 2578 shows many of the same qualities of the GECX 2029, such as the well-applied and even paint work, and numerous decals along the shell. A few differences start off with the cab-mounted PTC antenna array, windowless cab door, and three-grille air intake behind the cab, where GECX 2029 only had two air intake sections. Another and perhaps biggest variation and noticeable difference is the engine hood is not raised on production models, as is true of the blue demonstrators. Only the demonstrators were equipped with this raised roof line. I made it all to way to this point before I noticed that the vents and grilles are sprayed with black and gray highlight paint. This adds to the depth of the vents, and I’m glad that ScaleTrains.com added this detail feature in building these N-scale diesel models. This is a normal step I perform during the weathering process that tends to be a bit of a challenge, due to the size of the vents and the difficulty of working with the finished, assembled model. This detail feature removes one painful step in weathering, and shows the commitment to high quality ScaleTrains.com has made for this and other releases. Another detail that also stands off the body is painted handrails. The white or yellow paint around the stairs on the handrails is a feature often skipped, or presented in molded plastic coloring. The handrails are very well done on all these models. 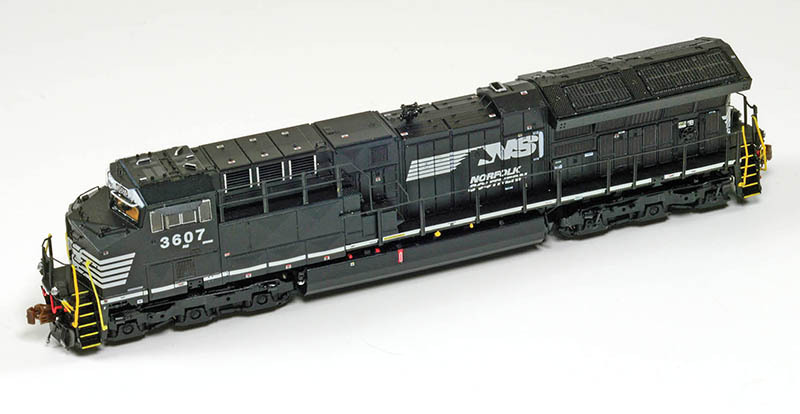 Looking sharp in basic black, Norfolk Southern models include working ditch lights. Not only do the front ditch lights function, but the rear ditch lights work too. This allows for NS long-hood forward operation without sacrificing working ditch light effects. Thoroughbred Tier 4: Norfolk Southern (NS) 3607 brings a bit more change from the first two models examined. Starting with the front, NS 3607 has a different handrail configuration than the other three models, with a wider stanchion distance across the front walkway. Another major difference is the shape of the handrail around the steps. NS has more rounded handrails, where in all other models the handrails tend to follow the shape of the steps. The rear walkway has the same wide stanchion and large curved handrails as the front. The NS model seems to have a more noticeable water sight glass on the fireman’s side. I’m not sure if it’s because it’s a white box on a black body or if it’s just truly larger than the others. The cab brings the next difference, which is an NS standard for most power, the cab-mounted headlight between the number boards. The NS model has the tapered body around the exhaust that follows the outline of the radiator section. One awesome feature specific to the NS model is working, alternating ditch lights on both the front and rear of the locomotive. The fact that the guys at ScaleTrains.com took the time to ensure that the lighting worked in both directions is a complete step up for N-scale models. This way NS units can lead long-hood forward and run true to prototype with working ditch lights. The eye-catching silver truck sideframes, tanks, and underbody make the BNSF release a standout for viewing the impressive detail on this N-scale Tier 4 GEVO diesel model. This version is an ET44C4 with a unique wheel design. Wedge Tier 4: BNSF 3786 has a bit of each previously described Tier 4 GEVO model. The front of the locomotive has low-profile handrails and a nose-mounted light. The cab roof sports the BNSF-style PTC antenna farm and another added bit is the small mirror just behind the cab window on the engineer side. The roof line has the lower engine hood and tapered filter housing around the exhaust. The underbody really stands out on this BNSF model as it appears, like the prototype, painted silver. The bright silver finish really makes all the little details pop and stand out on the model. One big change on the BNSF models is the extra piping on the truck sides. BNSF bought ET44C4s meaning these units have a raiseable center axle to force more weight onto the outside axles. This results in extra cylinders and piping on the truck side frames. BNSF 3786 also shows off the lightly sprayed vents and openings for added depth along the radiator section. Most of the paint is clean and crisp, except for one spot on the battery boxes on the engineer’s side of the cab. Here the cab piece doesn’t quite line up with the walkway, so the small black striping doesn’t fully line up. The battery box covers do not have the striping across them either; it just stops and then starts again on the other side of the covers. The paint on the vents is also a bit botched, as there are small patches of black showing around the molded vents where the orange paint didn’t completely cover. This view of UP 2578 on its side provides a good look at the speaker openings on the bottom of the fuel tank, the elaborate underbody details, and the body-mounted knuckle couplers. The couplers represent ScaleTrains.com’s own design. One final note for this BNSF model. I didn’t notice it until I was just about to wrap up my examination of this model and the light hit it just right. The lower hood where it meets the walkway includes a covering of glue. The design has the walkway with tread pattern glued to the shell. The result on this sample is an excessive amount of glue visible on the walkway. After spotting this, I looked over each sample model and all four had at least a few spots of CA adhesive residue along this area. The BNSF 3786 showed the most excess glue with a solid bead all the way down the fireman’s side from the steps to the very end of the hood. Model Railroad News received three models with Digital Command Control (DCC) and sound, while the GECX 2029 was standard d.c. I wanted to include a section about swapping out the d.c. plug with a DCC decoder. I picked up an ESU LokSound V4.0 micro (#54898) to see how much work it is to install digital control and sound. When picking up a decoder make sure you buy one with the Next18 plug or it will not plug into the board. 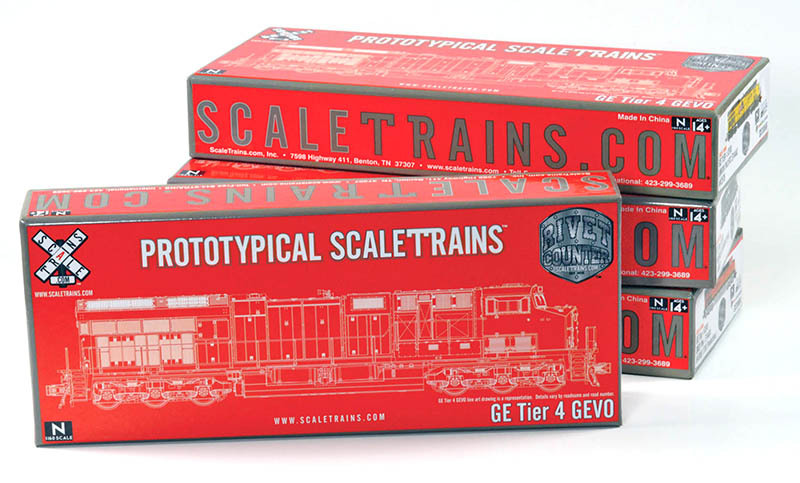 You’ll find the new N-scale ScaleTrains.com Tier 4 GEVO diesel models packaged in a very sturdy two-piece heavy cardboard box. The model comes encased in a clear plastic shell surrounded by foam inserts. After removing the couplers, the shell will lift right off. The bottom of the fuel tank has two screws that must also be removed. Carefully remove the fuel tanks; there are a few separately applied details that may tend to pop off. The decoder snaps into the PC board from the bottom and you’ll want to run the speaker wires forward and down the side of the motor to the opening in the fuel tank. I used a “sugar cube” speaker from SBS4DCC.com mounted to a flat piece of styrene. I soldered the speaker wires and secured the speaker to the bottom of the frame with double-sided tape. After putting the fuel tank back on, I started to put the body shell back when I noticed it didn’t fit. The DCC unit was too wide to fit inside the shell. I had to unsolder the speaker and remove the decoder, so I could file down on the decoder’s sides. The ESU speakers have a bit of spare board on the sides that you can remove without causing any issues, but always work in small strokes. It is very easy to get carried away and remove too much. Once I filed it, I used the removed shell to check the clearance before reassembling everything. Finally, I had reduced the decoder size enough to fit and so I walked back through the process of reinstalling the decoder. On testing it, I found that my install was not as loud as the stock models by just enough to tell a difference. Aside from the volume, everything worked just like the others. These models run and sound fantastic. The drives are very smooth with great motor control at low speeds. A few models had a bit of lurching at speed step 1, but was not discernible a few speed steps later. ESU has a good file for these locomotives with a wide selection of horns to make each one sound just like the prototype. The smooth operating drive mechanism provides uniformly excellent results during MODEL RAILROAD NEWS’ evaluation of its samples. ScaleTrains.com produced Tier 4 GEVOs with factory-installed DCC and ESU LokSound, as well as releases set up for standard d.c. operation. The lighting is well done and very clear and bright. The light tubing appears to line up with no fogging or clouding to give it a dull output. Though the lighting looks good in the openings, there is quite a bit of light leak where the cab and body shell meet, as well as in and around the radiator section. CSX models have alternating ditch lights, where the NS models have working ditch lights in both directions, operational either way the locomotive is running. One feature that bugs me is the number boards. While all number boards are illuminated, they are track powered with no way of controlling them from the decoder. The decoder is set up for independent control of the headlight on F0, ditch lights on F6, and a DPU mode on F5. The DPU mode turns all lights off except for the tailing light. It goes dim much like the locomotives on the tail end of a train. You can turn this function on before MUing units to the leaders to add to the prototypical lighting. The decoder has a number of sounds that include the prime mover, horn, bell, compressor, spitters, and much more. ESU even added the new electric handbrake sound for these units. One thing that worried me when these units came out was the sound. The Tier 4 units are very distinct and significantly quieter than the previous Tier 3. This could prove to be a challenge when adding sound to these models. After a bit of research, I found the prototype tends to be very quiet when not operating or when idling. The recording from ESU catches a lot of the mechanical sounds, as well as the engine sounds very clearly. For those buying more than one, ESU currently has two different ET44 sound files on its website that you can use to easily re-write your model’s sound using an ESU LokProgrammer. All four models passed a coupler height and wheel gauge test. The couplers are new ScaleTrains.com items and look to possibly be based on McHenry-style knuckle couplers. They are a bit bulky, but have many molded details to better look like a real coupler. While they look nice, they are not my favorite in regards to operations due to the spring being located on the outside of the coupler. This creates the possibility during adjusting, uncoupling, or fixing the coupler of having the spring dislodge from the posts and shoot off the coupler. You must then replace the spring or install a completely new coupler. The ScaleTrains.com coupler does couple well with most brands except for Kato. I found the Kato couplers have a significantly smaller hand, which does not open well against the design of this ScaleTrains coupler. All together these models really raised the bar for N-scale motive power. The separately applied details and attention to road specific changes across the releases really shows the dedication to making these models as close to the prototype as possible. ESU has put together a great file for these units and a good selection of different horns that allows for each road name to sound more like the real one. The lighting was also very well done, despite the light leaks in some parts of the body. Other than the cab on the BNSF model, the paint was clean and crisp. The number of decals, especially the smaller warning stickers, really makes these models pop. Most modelers may not notice the glue residue along the body unless under direct light, but I hope this is something ScaleTrains works harder to avoid on its future releases. I feel the price is very fair for what you get out of these models and they are a must-have for any modern-era modeler.